The Village of Ellsworth has a deep and rich history reflected in the many historic points of interest throughout our area. Take a trip back in time and see what life was like in days gone by. Pierce County Courthouse: The Pierce County Courthouse, listed in the National Register of Historic Places, was built on a raised foundation of sandstone. It features elements of both the Beaux-Arts and Neoclassical styles of architecture. Among the distinctive elements of its construction are a large hexagonal dome and multiple Ionic columns. Crafted from Marquette Rain Drop Stone, Siskiwit Stone, Dunville Stone, and Pink Tennessee Marble, the courthouse features four original paintings depicting the beauty of the Midwest, which grace the courthouse dome. The cornerstone was laid by the Ellsworth Masonic Hancock Lodge #229 on June 21, 1905 and the building was constructed at a cost of $85,000.00. Extensive remodeling, which included the jail being built adjacent to the courthouse, was completed in 1968. A World War I 88mm Austrian cannon compliments the war memorial on the courthouse grounds. The cannon, obtained from an arsenal in New Jersey, was dedicated in 1926; the memorial was erected in 1989. Plaques honoring Pierce County service people were dedicated on June 24, 1989. The most recent entry was for Bert Hoyer of Ellsworth and Trevor Diesing of Plum City, who lost their lives in the defense of liberty in Iraq. 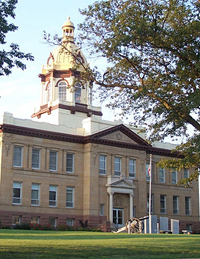 A twin to our courthouse can be found in Rugby, North Dakota. The courthouse is open to the public Monday through Friday. The River Bluffs History Center: The River Bluffs History Center overlooks Lake Pepin, a widening of the Mississippi River. The center is located at W6321 E. Main Street, Bay City, one block west of Hwy. 35, the Wisconsin Great River Road. The Pierce County Historical Association (PCHA) received the former St. John's Lutheran Church as a gift in 1995. The 28-by-60 foot building was erected in 1933. The hand-carved altar, communion rail, pulpit, organ and five pews were also donated, as well as kitchen furnishings, tables and chairs in the downstairs fellowship room. PCHA volunteers, with professional help, have redecorated the interior, re-roofed and resided the exterior. In 2001, an accessibility fund was initiated for easier building access. Activities at the center include special exhibits, workshops, association and chapter meetings, the 85-Mile Garage Sale each May, a pancake breakfast during Bay City Days, the annual October Open House and a holiday party in November. Everyone is welcome to attend the gatherings. The center is also available for small gatherings. The dining room seats up to 50 people. Call the PCHA office at 715-273-0118 for more information or visit their website here. Conlin Log House: The Conlin Log House is located on the River Bluffs History Center site. This 17-by-25 foot 1850's log house was built by Patrick Conlin, an Irish immigrant, near the Village of Esdaile in Hartland Township. Patrick and his wife, Margaret, were parents of seven children; only three survived until adulthood. The house was inhabited until 1901, when it was sold at a sheriff's auction. In the 1920's, the house was moved, log by log, to a different location on the Vincent Wood farm, where it was used as a granary. In 1998, Mr. Wood donated the building to the association. A Conlin descendant, Millicent O'Connor, paid the moving expenses. The house was moved intact from Esdaile to the center. PCHA volunteers, with some professional help, replaced some logs. Doors and windows were added in the style of the original house, and ceiling joists, downstairs flooring and the entire loft floor were replaced. The building was rechinked and a cedar shake roof replaced the tin roof. Volunteers also furnished the home with items used in the early settlement period, including a rope bed used in the early 1850's. The home is open to visitors one weekend each month in the summer, as is the River Bluffs History Center. Signs are posted along Hwy. 35 when the buildings are open. Additional information can be found on their website here. The Freier Schoolhouse: In 1959, the Freier Schoolhouse was moved to the Pierce County Fairgrounds along Hwy. 65 in the Village of Ellsworth as a memorial to all the rural Pierce County schools. It is open to the public during the county fair in August. PCHA installed new windows and a new entrance door, furnished the interior and has special exhibits during the county fair and for other occasions. Freier School was built in 1855 in Sec. 9, Ellsworth Township. Local basswood and maple was sawn and used in the 20-by-32 foot building. The total cost was $539. Metal decorative walls are still in the building. The school closed in 1957 when the area was consolidated with the Ellsworth School System. For more information and hours of operation, call the Pierce County Historical Association Office and Archives at 715-273-6611 for visit their website here.